Claremont, Calif. (June 2, 2015)—And the hits just keep coming. Pitzer College alumnus and Sagehen shortstop Samuel Fox ’15 added to his postseason awards today when he was named to the Capital One Academic All-America Third Team, it was announced today by the College Sports Information Directors of America (CoSIDA). The Academic All-America honor completes a long list of accolades for Fox, who had his best collegiate season as a senior. He hit .425 on the season with six homers and 40 RBI, ranking second on the team in RBI despite batting leadoff for most of the year, and had a 28-game hitting streak that lasted over two months. He reached base via a hit in 39 of 41 games this season, helping the Sagehens to a 28-13 record. Fox’s stellar numbers earned him American Baseball Coaches Association/Rawlings Third-Team All-America honors, the SCIAC Athlete of the Year award and the ABCA/Rawlings West Region Player of the Year. He was also a first-team All-West Region selection by D3baseball.com. In the classroom, Fox graduated from Pitzer College this May as a double major in political studies and English & world literature. He carried a 3.55 cumulative GPA into his senior spring and was a SCIAC All-Academic team selection. Fox is the Sagehens’ second Capital One/CoSIDA Academic All-America winner this academic year, joining volleyball player Allie Frappier PO ’16, who was selected to the second team in the fall. 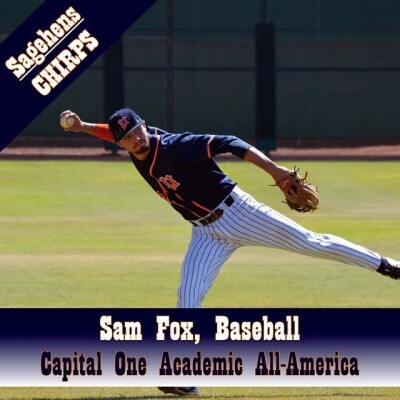 Fox is the first Sagehens Baseball player to earn Academic All-America honors since Nick Gentili PO ’13 earned a spot on the third team in 2012. Mike Moyer PO ’13, Jake Bruml PO ’15 and Simon Rosenbaum PO ’16 have all earned Capital One Academic All-District accolades in the interim. Pitzer College joins with Pomona College to field 21 varsity teams – The Sagehens – that compete in Division III NCAA athletics and as members of the Southern California Intercollegiate Athletic Conference (SCIAC). There are 10 men’s and 11 women’s teams: baseball (men), basketball, cross country, football (men), golf, lacrosse (women), soccer, softball (women), swimming and diving, tennis, track and field, volleyball (women) and water polo.